HAARETZ – For God’s Sake, Enough With This Obsession Over Judaism. This Jewish mumbo-jumbo has to stop. It’s an obsession. Israel has become an intolerable place for a Jew to live in. Everything has turned topsy turvy. The Israeli state was set up to give Jews one corner on earth where they wouldn’t be scrutinized, their identity not put under a microscope and the extent of their loyalty not be inspected morning noon and night. They would simply be left alone. Every man has a right to believe – or not to believe – what he chooses. But there is no place in the world today where Jews are harassed about their Jewishness like they are in Israel. In any other place and at any other time it would be seen as racism and anti-Semitism. Once it used to be the sole domain of the Orthodox rabbinate and the Interior Ministry. The harassment was despicable and humiliating, but instrumental in nature (conversion, burial, the Law of Return). Since then the dam has broken and anyone who gets hold of a microphone or keyboard is drafting decisive theories about who’s a Jew. Avi Gabbay didn’t invent anything, at most he brought a prevalent trend to the realm of the grotesque. Let’s face it: In exile, for hundreds of years, the Jewish nation produced the wisest people in the world, and in 70 years of sovereignty it succeeded in becoming extremely stupid. There are of course circumstances, some of them mitigating. The Holocaust and revival screwed the nation up. The nation-state knocked it out of balance. Sanctifying the land and the militarism drove it out of its mind. Then came capitalism and populism and, together with commercial television, finished the job. In the meantime there’s been a deevolution. Einstein and Leibowitz don’t live here anymore. Maimonides was replaced by Maran, the late Ovadia Yosef. Orthodox Zionist moderates Yosef Burg and Haim Moshe Shapira were replaced by Naftali Bennett and Bezalel Smotrich. Hannah Arendt’s place was taken by Irit Linur. And the party that had been led by wise, sober Jews like Ben-Gurion, Sharett and Eshkol is now led by Gabbay. Unlike some of my best leftist friends, I refuse to be offended by his ideas about Judaism and God. As far as I’m concerned he’s mainly insulting himself. Meanwhile the question of political acumen remains open: A man is elected to represent a camp and lead it back to power, and then chooses to attack it again and again. It was said once that the Jewish head comes up with solutions and patents. Who knows, maybe we’ll find out that the man has discovered a global patent. One way or the other, Gabbay is only the symptom. We’re dealing with a national mental illness. From right and left, from top to bottom, the preoccupation of Jews with their Jewishness is simply obsessive. And all this is taking place, paradoxically, after they received a state of their own and have long ensured its thriving existence. They’re demanding that even the Arabs recognize its Jewishness. How insecure can a nation be in its country and identity? Now they’re trying to enact a “nation-state law” that would subject the state to its Jewishness, while at the same time compelling the justice system to rule in favor of “Jewish law” when there is doubt. But it’s necessary to remind everyone: Judaism germinated as a religion, but developed into a people. A Jew is a person whose mother is Jewish, or has chosen to join the Jewish people. He can be ultra-Orthodox, religious, observant, a believer, secular, atheist. Zionist or not, leftist or not, it doesn’t matter. As long as he’s a human being. For God’s sake, so to speak, leave us alone. Many of the historical beliefs, which have percolated down to us, are based on distortions, half-truths or on no truths at all. According to political analyst Jeremy R. Hammond, the predominant view regarding the creation of Israel, which lies at the core of the so-called Israeli-Palestinian conflict, is no exception. He renders a detailed account of a manipulation, injustice and UN failure to abide by its own rules, which have wreaked political turmoil and humanitarian catastrophe in the Middle East region for more than sixty years. The 1947 UN General Assembly session that adopted Resolution 181. In other words, the report explicitly recognized that the denial of Palestinian independence in order to pursue the goal of establishing a Jewish state constituted a rejection of the right of the Arab majority to self-determination. And yet, despite this recognition, UNSCOP had accepted this rejection of Arab rights as being within the bounds of a legitimate and reasonable framework for a solution. A simple reading of the text is enough to show that the resolution did not partition Palestine or offer any legal basis for doing so. It merely recommended that the partition plan be implemented and requested the Security Council to take up the matter from there. It called upon the inhabitants of Palestine to accept the plan, but they were certainly under no obligation to do so. “The Arab Delegations submitted proposals in the Ad Hoc Committee in order to refer the whole legal issue raised for a ruling by the International Court of Justice. The said proposals were never put to vote by the president in the Assembly. The United Nations is an International body entrusted with the task of enforcing peace and justice in international affairs. How would there be any confidence in such a body if it bluntly and unreasonably refuses to refer such a dispute to the International Court of Justice? 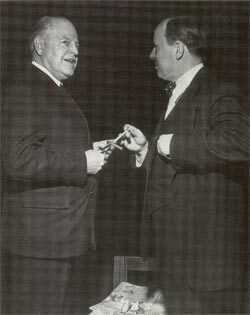 Warren R. Austin (L), Permanent U.S. Representative to the United Nations, January 1946-January 1947.
subject to the limitation that armed force cannot be used for implementation of the plan, because the Charter limits the use of United Nations force expressly to threats to and breaches of the peace and aggression affecting international peace. Therefore, we must interpret the General Assembly resolution as meaning that the United Nations measures to implement this resolution are peaceful measures. On 14 May 1948, one day before the British Mandate expired, David Ben-Gurion unilaterally declared the establishment of the State of Israel, referring to the decision of the UN General Assembly as a legal justification for the establishment of the state. On May 14, the Zionist leadership unilaterally declared the existence of the State of Israel, citing Resolution 181 as constituting “recognition by the United Nations of the right of the Jewish people to establish their State”. As anticipated, war ensued. Chapter 1, Article 1 of the U.N. Charter defines its purposes and principles, which are to “maintain international peace and security”, to “develop friendly relations among nations based on respect for the principle of equal rights and selfdetermination of peoples”, and to “achieve international co-operation” on various issues and “promoting and encouraging respect for human rights and for fundamental freedoms for all”. The functions and powers of the General Assembly are listed under Chapter IV, Articles 10 through 17. It is tasked to initiate studies and make recommendations to promote international cooperation and the development of international law, to receive reports from the Security Council and other organs of the U.N., and to consider and approve the organization’s budget. It is also tasked with performing functions under the international trusteeship system. Its authority is otherwise limited to considering and discussing matters within the scope of the Charter, making recommendations to Member States or the Security Council, or calling attention of matters to the Security Council. Chapter V, Articles 24 through 26, states the functions and powers of the Security Council. It is tasked with maintaining peace and security in accordance with the purposes and principles of the U.N. The specific powers granted to the Security Council are stated in Chapters VI, VII, VIII, and XII. Under Chapter VI, the Security Council may call upon parties to settle disputes by peaceful means, investigate, and make a determination as to whether a dispute or situation constitutes a threat to peace and security. It may recommend appropriate procedures to resolve disputes, taking into consideration that “legal disputes should as a general rule be referred by the parties to the International Court of Justice”. Under Chapter VII, the Security Council may determine the existence of a threat to peace and make recommendations or decide what measures are to be taken to maintain or restore peace and security. It may call upon concerned parties to take provisional measures “without prejudice to the rights, claims, or position of the parties concerned.” It may call upon member states to employ “measures not involving the use of armed force” to apply such measures. Should such measures be inadequate, it may authorize the use of armed forces “to maintain or restore international peace and security”. Chapter VIII states that the Security Council “shall encourage the development of pacific settlements of local disputes” through regional arrangements or agencies, and utilize such to enforce actions under its authority. The functions and powers of the International Trusteeship System are listed under Chapter XII, Articles 75 through 85. The purpose of the system is to administer and supervise territories placed therein by agreement with the goal of “development towards self-government or independence as may be appropriate to the particular circumstances of each territory and its peoples and the freely expressed wishes of the peoples concerned”. The system is to operate in accordance with the purposes of the U.N. stated in Article 1, including respect for the right of self-determination. The General Assembly is tasked with all functions “not designated as strategic”, which are designated to the Security Council. A Trusteeship Council is established to assist the General Assembly and the Security Council to perform their functions under the system. To that end, Member states are “to develop self-government, to take due account of the political aspirations of the peoples, and to assist them in the progressive development of their free political institutions”. The Partition Plan put forth by UNSCOP sought to create within Palestine a Jewish state contrary to the express will of the majority of its inhabitants. Despite constituting only a third of the population and owning less than 7 percent of the land, it sought to grant to the Jews more than half of Palestine for purpose of creating that Jewish state. It would, in other words, take land from the Arabs and give it to the Jews. The inherent injustice of the partition plan stands in stark contrast to alternative plan proposed by the Arabs, of an independent state of Palestine in which the rights of the Jewish minority would be recognized and respected, and which would afford the Jewish population representation in a democratic government. The partition plan was blatantly prejudicial to the rights of the majority Arab population, and was premised on the rejection of their right to self-determination. This is all the more uncontroversial inasmuch as the UNSCOP report itself explicitly acknowledged that the proposal to create a Jewish state in Palestine was contrary to the principle of selfdetermination. The plan was also premised upon the erroneous assumption that the Arabs would simply acquiesce to having their land taken from them and voluntarily surrender their majority rights, including their right to self-determination. U.N. General Assembly Resolution 181 neither legally partitioned Palestine nor conferred upon the Zionist leadership any legal authority to unilaterally declare the existence of the Jewish state of Israel. It merely recommended that the UNSCOP partition plan be accepted and implemented by the concerned parties. Naturally, to have any weight of law, the plan, like any contract, would have to have been formally agreed upon by both parties, which it was not. Nor could the General Assembly have legally partitioned Palestine or otherwise conferred legal authority for the creation of Israel to the Zionist leadership, as it simply had no such authority to confer. When the Security Council took up the matter referred to it by the General Assembly, it could come to no consensus on how to proceed with implementing the partition plan. It being apparent that the plan could not be implemented by peaceful means, the suggestion that it be implemented by force was rejected by members of the Security Council. The simple fact of the matter is that the plan was never implemented. Numerous delegates from member states, including the U.S., arrived at the conclusion that the plan was impracticable, and, furthermore, that the Security Council had no authority to implement such a plan except by mutual consent by concerned parties, which was absent in this case. The U.S., Syria, and other member nations were correct in their observations that, while the Security Council did have authority to declare a threat to the peace and authorize the use of force to deal with that and maintain or restore peace and security, it did not have any authority to implement by force a plan to partition Palestine contrary to the will of most of its inhabitants. Any attempt to usurp such authority by either the General Assembly or the Security Council would have been a prima facie violation of the Charter’s founding principle of respect for the right to selfdetermination of all peoples, and thus null and void under international law. Further corollaries may be drawn. The disaster inflicted upon Palestine was not inevitable. The U.N. was created for the purpose of preventing such catastrophes. Yet it failed miserably to do so, on numerous counts. It failed in its duty to refer the legal questions of the claims to Palestine to the International Court of Justice, despite requests from member states to do so. It failed to use all means within its authority, including the use of armed forces, to maintain peace and prevent the war that was predicted would occur upon the termination of the Mandate. And most importantly, far from upholding its founding principles, the U.N. effectively acted to prevent the establishment of an independent and democratic state of Palestine, in direct violation of the principles of its own Charter. The consequences of these and other failures are still witnessed by the world today on a daily basis. Recognition of the grave injustice perpetrated against the Palestinian people in this regard and dispelling such historical myths is essential if a way forward towards peace and reconciliation is to be found. Article by Dr. Mordechai Nisan refuting Mr. Hammond’s arguments: Is UN Creation of Israel a Myth? Ask Foreign Policy Journal, published by Israel National News (INN) on 27 October 2010. Mr. Hammond’s response of 28 October 2010 to Dr. Nisan’s rebuttal: Rejoinder to ‘Is UN Creation of Israel a Myth? Ask Foreign Policy Journal’. The Palestine Mandate of the Council of the League of Nations, July 24, 1922. Great Britain had contributed to the conflict by making contradictory promises to both Jews and Arabs, including a declaration approved by the British Cabinet that read, “His Majesty’s Government view with favour the establishment in Palestine of a national home for the Jewish people, and will use their best endeavours to facilitate the achievement of this object, it being clearly understood that nothing shall be done which may prejudice the civil and religious rights of existing non-Jewish communities in Palestine, or the rights and political status enjoyed by Jews in any other country.” This declaration was delivered by Foreign Secretary Arthur James Balfour to representative of the Zionist movement Lord Lionel Walter Rothschild in a letter on November 2, 1917, and thus came to be known as “The Balfour Declaration“. Letter from the United Kingdom Delegation to the United Nations to the U.N. Secretary-General, April 2, 1947. U.N. General Assembly Resolution 106, May 15, 1947. United Nations Special Committee on Palestine Report to the General Assembly, September 3, 1947. 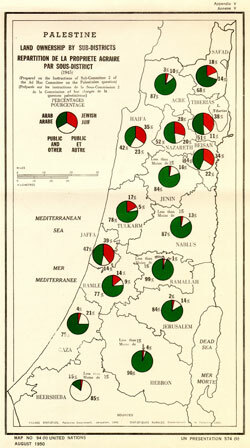 “Palestine Land Ownership by Sub-Districts (1945)”, United Nations, August 1950, http://domino.un.org/maps/m0094.jpg. The map was prepared on the instructions of Sub-Committee 2 of the Ad Hoc Committee on the Palestinian question and presented as Map No. 94(b). Statistics were as follows (Arab/Jewish land ownership in percentages): Safad: 68/18; Acre: 87/3; Tiberias: 51/38; Haifa: 42/35; Nazareth: 52/28; Beisan: 44/34; Jenin: 84/1, Tulkarm: 78/17; Nablus: 87/1; Jaffa: 47/39; Ramle: 77/14; Ramallah: 99/less than 1; Jerusalem: 84/2; Gaza: 75/4; Hebron: 96/less than 1; Beersheeba: 15/less than 1. Walid Khalidi, “Revisiting the UNGA Partition Resolution“, Journal of Palestine Studies XXVII, no. 1 (Autumn 1997), p. 11. Edward W. Said, The Question of Palestine (New York: Vintage Books Edition, 1992), pp. 23, 98. “U.K. Accepts UNSCOP General Recommendations; Will Not Implement Policy Unacceptable by Both Arabs and Jews“, Press Release, Ad Hoc Committee on Palestinian Question 2nd Meeting, September 26, 1947. “The Arab Case Stated by Mr. Jamal Husseini“, Press Release, Ad Hoc Committee on Palestinian Question 3rd Meeting, United Nations, September 29, 1947. “Palestine Committee Hears U.K. Stand and Adjourns; Sub-Committees Meet“, Press Release, Ad Hoc Committee on Palestine 24th Meeting, United Nations, November 20, 1947. “Ad Hoc Committee on the Palestinian Question Report of Sub-Committee 2“, United Nations, November 11 1947. United Nations General Assembly 128th Plenary Meeting, United Nations, November 29, 1947. United Nations General Assembly Resolution 181, November 29, 1947. United Nations Security Council 222nd Meeting, December 9, 1947. “First Special Report to the Security Council: The Problem of Security in Palestine“, United Nations Palestine Commission, February 16, 1948. Draft Resolution on the Palestinian Question Submitted by the Representative of Colombia at the 254th Meeting of the Security Council, February 24, 1948. U.N. Security Council 253rd Meeting (S/PV.253), February 24, 1948. Draft Resolution on the Palestinian Question Submitted by the Representative of the United States at the Two Hundred and Fifty Fifth Meeting of the Security Council, February 25, 1948. United Nations Security Council 260th Meeting, March 2, 1948. United Nations Security Council Resolution 42, March 5, 1948. U.N. Security Council 271st Meeting, March 19, 1948. United Nations Security Council 274th Meeting, March 24, 1948. United Nations Security Council 275th Meeting, March 30, 1948. United Nations Security Council Resolution 43, April 1, 1948. United Nations Security Council Resolution 44, April 1, 1948. United Nations Security Council Resolution 46, April 17, 1948. United Nations Security Council Resolution 48, April 23, 1948. 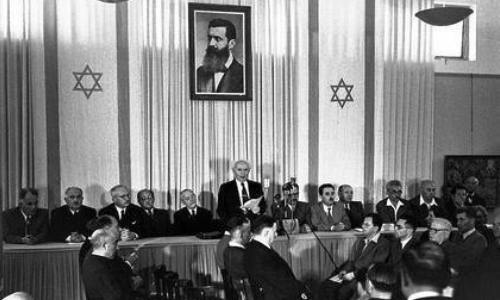 The Declaration of the Establishment of the State of Israel, May 14, 1948.